"After 3 years of continuous pain and struggle, my 7-year-old came home. Doctors said he has completely recovered from cancer. He was living a very normal life like other children and went to school for the next 5 months. But I was so cautious about his every step, I was overprotective because I didn't want my son to go through the cruel pain again in his life. But now I regret it - I should have let him play happily and go to school regularly. I should have let him eat whatever he wanted. I didn't know that he is destined to battle cancer for the second time. I can't bear that his childhood memories will be filled only with hospitals and injections." - Jayachandiran, father of Kavindiran. 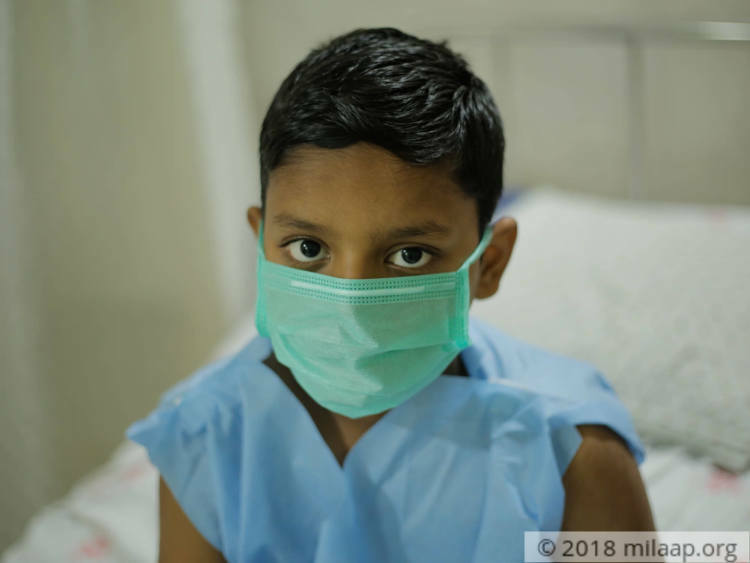 When Kavindiran turned 5, he was diagnosed with Lymphoblastic Leukemia, a type of cancer that starts from the white blood cells in the bone marrow. It usually invades the blood quickly. They can rapidly spread to other parts of the body. He was given chemotherapy until Jan 2018. In just another 5 months, he had a relapse and now he has to start the treatment again from scratch for the next 8 months. "He was very active and grew up healthy till he turned 5. He was a steady walker by that time but suddenly he was not able to stand up let alone walk. When we put him on his feet he would begin to cry in pain. We thought he must have hurt his leg but not even in our wildest dreams we thought it would be a cancer. That very word shattered us beyond words. We somehow fought it with all our strength and finally took him back home. I can't bear that he has got it again. I feel completely lost." - Jayachandiran. Kavindiran was taken for a regular check-up after this recovery. He had no fever, not even a cold and his blood count was perfect. His parents Jayachandirandan and Tamilselvi started to hope that their worst is over but soon they realized they were wrong. They observed that he had squint eyes but they thought it may be because of watching TV for a long time. "I took proper care of him, he didn't even feel tired in these 5 months. I was sure that it should be some normal infection. When doctors said that cancer has relapsed, I couldn't believe it, even now I can't come to terms with it. How can fate be so cruel to a child? He is asking me constantly when he can go back home. He doesn't understand why he is given so many injections. I couldn't answer any of his questions." - Tamilselvi, Mother. Jayachandiran works as a teacher in the same school where Kavindiran is studying. He had missed so many classes and was not been able to be regular to school. Yet, he was promoted every year because he was smart and was able to pick up lessons quickly despite missing classes. He will be missing his class this year too. 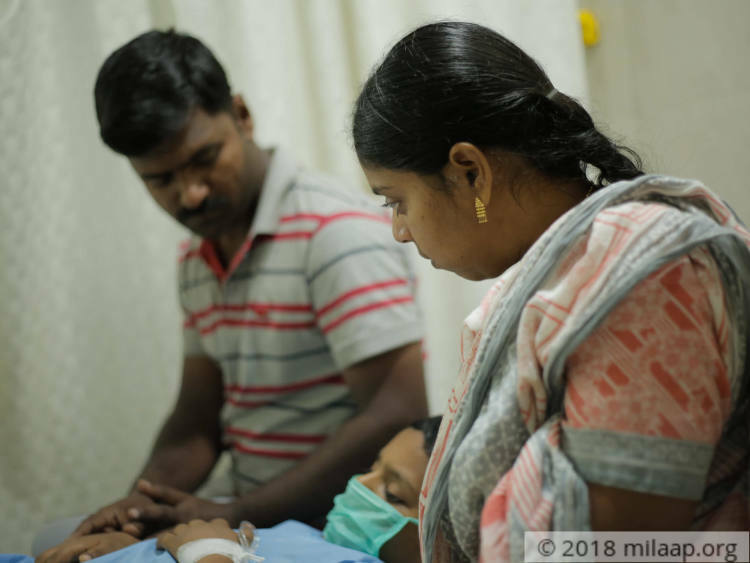 Although it is painful for his father, his focus is now only to save his son's life. His mother who was also working as a teacher resigned her job since his diagnosis to be his side. "When he was admitted for the first time, teachers and friends in the school helped us a lot. Even the hospital helped us. I borrowed money too and I haven't paid it back. Now we have to start the treatment again and I don't know whom to turn to help. It takes nearly an hour to reach the hospital from our home. We can't take him in a bus or two wheeler because he is prone to infections. We cant afford to pay the room charges everyday. So we bring him in a cab every week for the chemo without which he will not survive. It is terrible for all of us. He needs treatment for next 8 months, I don't know how I will manage." - Jayachandiran. 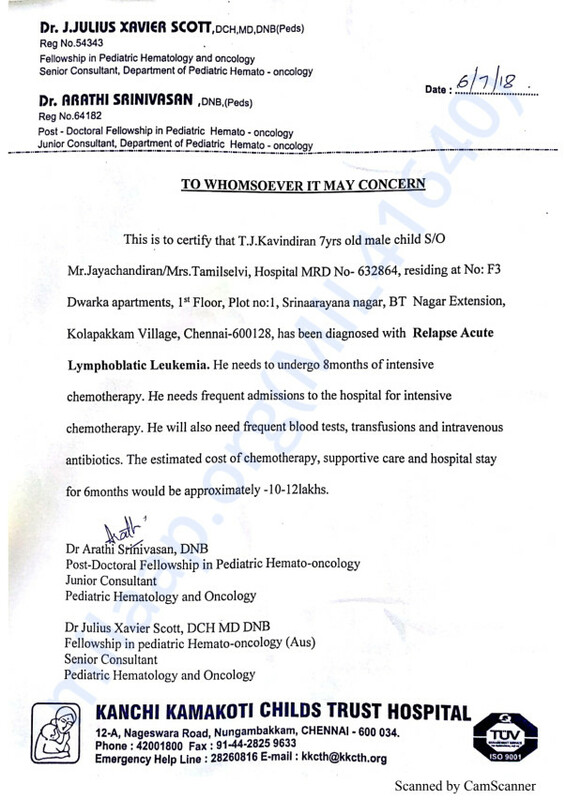 7-year-old Kavindiran is battling cancer of the second time. His father who is a teacher has already exhausted his sources for the treatment. Now he is helpless. 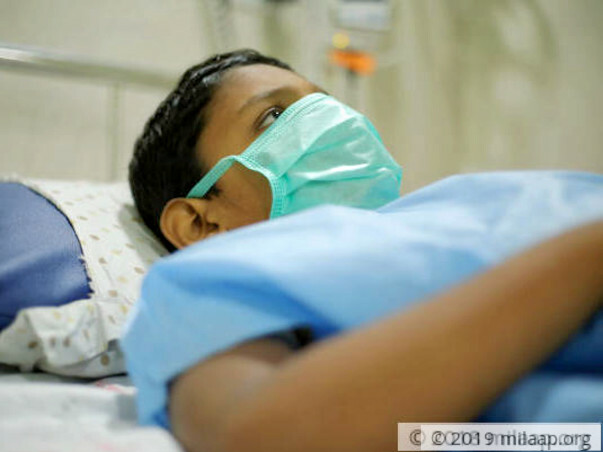 Kavindiran needs intensive chemotherapy for 8 more months. He will also need frequent blood transfusions and antibiotics. The treatment will cost around 12 lakhs. This little boy deserves to live a normal life. He doesn't know he has cancer and his parents are worried that they'll be forced to stop that treatment due to lack of money. Without your support, he will lose his life. 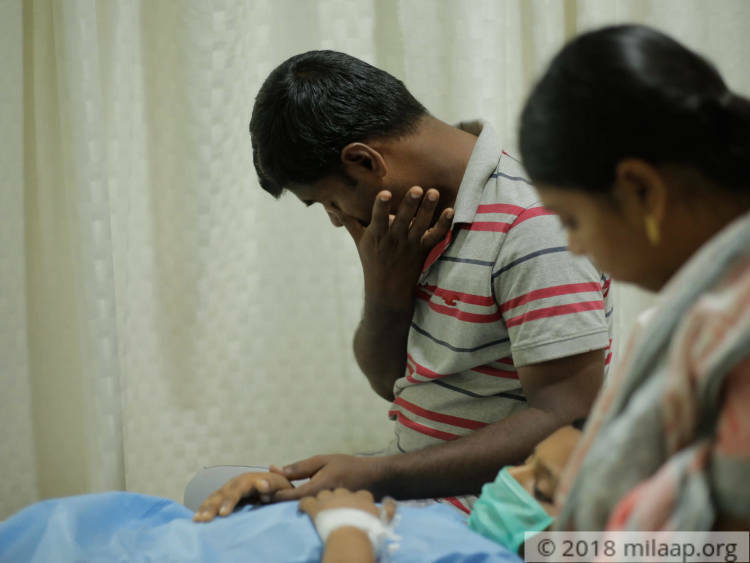 Here is a quick update on Kavindran's condition. His next cycle of Chemotherapy is done and has to be admitted again on Friday. Hospital is planning for his BMT, after seeing his medical reports on Friday. Thank you all so much for all your love! 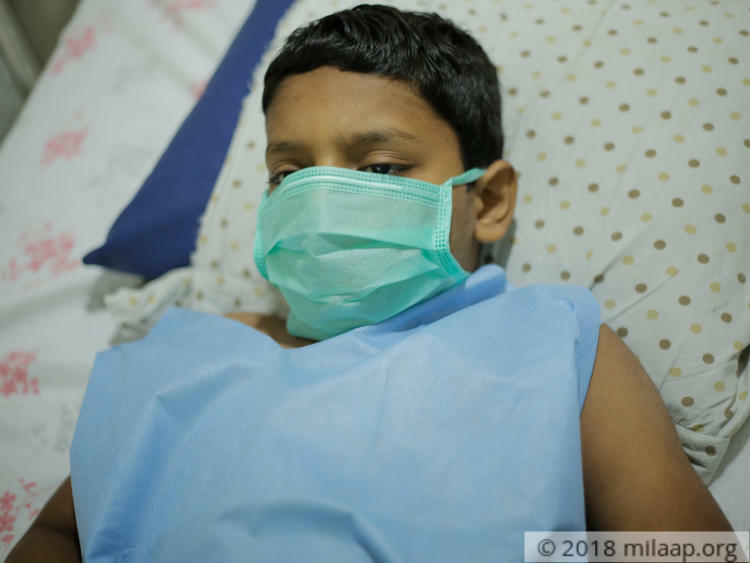 The doctors had conducted a bone marrow test on Kavindiran yesterday and based on the results they will take a call on when the bone marrow transplant will be scheduled. The results are expected to come sometime this week. He is still in the hospital. Tests were conducted on me, my wife and my other son. My wife's results are yet to come but the doctors are of the opinion that I am a better match than my other son and most probably I will be the donor. I am extremely grateful to you all for supporting my son in these crucial times. Thank you! Kavindiran is now doing okay. His counts have fallen again and the doctors have advised a bone marrow transplant to help him with his condition. His brother maybe a potential donor and the test results are awaited, post which the doctors may confirm the donor and decide the further course of action. Thank you everyone. We are all hopeful about his recovery and we shall keep you posted.